The amphibious airplanes are being actively promoted abroad. However, Russia will soon face serious competition in the hydro aviation industry from China and Japan. The Chinese amphibious aircraft JL-600 Water Dragon will enter the world market in 2015. It is a turboprop airplane with four engines that can be used on waves as high as six and a half feet. This plane is sure to be serious competition for the Russian Be-200. The existing Japanese and the forthcoming Chinese planes present a major threat to the export potential of the Russian one. Russia has a wealth of experience in the creation of seaplanes. However, seaplanes were always a type of “Cinderella” here. Hydroplanes were financed on the leftover principle and orders for amphibious aircraft by the state can be counted on one’s fingers. The export potential of these unusual airplanes was also unclear. There were no orders nor was there serial production, which means that there was no serious promotion of the technology in foreign markets. The Be-200 seaplane was designed on the basis of the A-40 Albatross jet-powered amphibious aircraft and intended for the purpose of firefighting. The plane’s design leaves room for modernization, making it possible for it to be used for the transport of cargo and people, as well as for patrolling and the execution of a number of other tasks. However, the situation has changed a bit for the better in the last few years. The heavy amphibious aircraft Be-200, the visiting card of Russian hydro aviation, was first ordered by the Ministry of Emergency Situations (MChS). In 2013 six such airplanes were ordered by the Ministry of Defence. The Russian military will receive its first craft by the end of the current year according to a statement released by the head of the United Aircraft Corporation UAC, Mikhail Pogosyan. 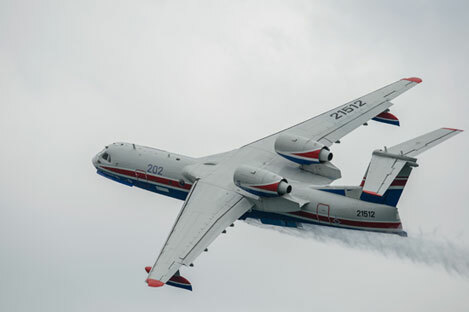 In line with the increase of production of the Be-200, its developer, the Beriev Aircraft Company and the Russian government are already actively promoting the airplane abroad where it will be used for search and rescue operations at sea and for extinguishing forest fires. As an example, at Paris Air Show 2013, specialists from the Beriev Aircraft Company held business meetings with representatives of a number of companies from Switzerland, Canada, the USA, France, and Chile. They spoke about the prospects for the promotion of the Be-200 and questions about its certification. Be-200ChS-E (also known as the Be-200ES-E) was certified by the European Aviation Safety Agency (EASA) in 2010. The Be-200 already succeeded in participating in the extinguishing of fires in France in 2011 during tests of this airplane’s capabilities and was evaluated very positively by French specialists. The Chief Designer at the Beriev Aircraft Company told RIA Novosti that The French Emergencies Ministry plans to rent the Be-200 amphibious airplane from Russia. However, despite the multitude of negotiations, the expansion of the geography of supply of the Be-200 has not yet happened. In the promising region of Southeast Asia, where amphibious craft are in demand for use in the large areas of water and could be used for patrolling the economic zone as well as search and rescue, Russia has lately encountered serious competition from the Asian powers, which makes it more difficult to export the Be-200 to this region. Japan has lifted its previously legislated ban on the export of military equipment and dual-use products this year. Earlier, the ShinMaywa Company, which manufactures amphibious aircraft, obtained permission from the Japanese Ministry of Defence to export ShinMaywa US-2 airplanes. In 2010 the Japanese amphibian participated in a tender for the Indian Navy where it beat out the Russian Be-200 and the Canadian CL-415. In early 2014 a preliminary agreement was reached between India and Japan on the supply of these airplanes to the Indians. Interest in the Japanese amphibian has already been expressed in Indonesia and Brunei. The loss of the Indian tender may affect the future prospects for the Be-200 negatively and force Russia to put additional effort into promoting the airplane. Moreover, the Chinese Water Dragon will soon be available. Despite the rather serious challenges faced by the Russian amphibian, the Be-200 has a chance to compete in the Latin American and Southeast Asian markets. There is a high demand for seaplanes around the world now as before. According to the industry analytical agency Aviaport, the forecast for seaplanes' market potential is 150 craft over the next 10 years. If the Russian Government intensifies design works and fortifies its marketing promotion of the Be-200, then, along with the renewed production of airplanes at Beriev Aircraft Company, we will see the Be-200 in foreign skies.